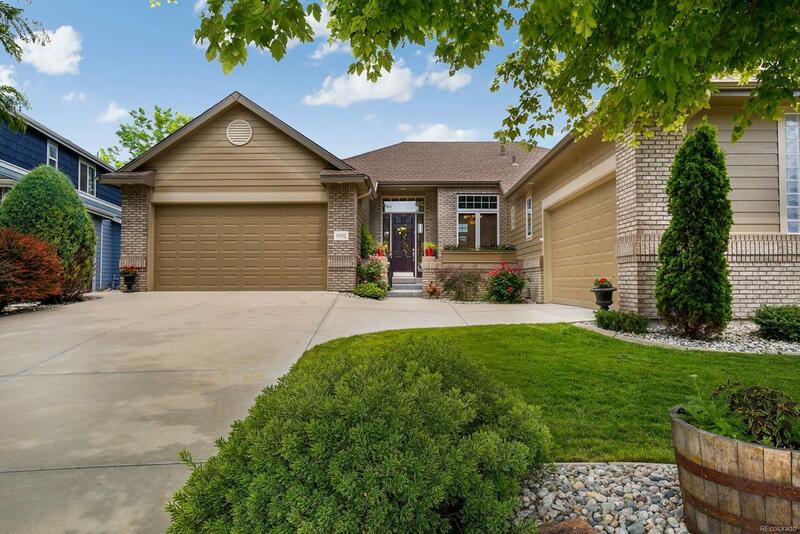 Stunning 6 beds/3 baths custom executive home backing to large greenbelt, w/ entry courtyard & spacious entertainers layout. An enchanting garden-oasis landscaping surrounds & nestles this neatly cared for property. Manicured easy-maintenance yard, garden beds and flagstone pathway will delight everyone for years to come. Walk-out covered stamped-concrete back porch accessible from kitchen/family & owners retreat. The private suite enjoys arched entryway, walk-in closet & relaxing garden/open space views. Spacious eat-in kitchen & family room full of elegant touches. Welcoming great room with 11 ft ceiling & tiled foyer. 8' doors throughout main floor. Finished basement offers ample 3 bedrooms, bath and rec area w/ wet bar. Additional features include tray ceilings, built-in speakers & 2 large bonus storage rooms. Two separate 2-car garages! Picturesque community, thoughtfully designed to maximize privacy between properties & provide plenty of green areas. Quick access to I-25!